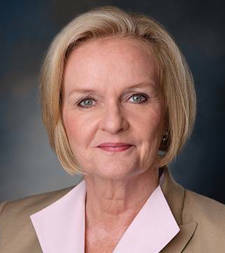 US Senator Claire McCaskill (D-MO) has written to the Federal Aviation Administration (FAA) asking for a rethink of the rules governing the use of in-flight electronics, and has threatened legislation if the agency won't shift its position. "We live in an increasingly connected world, and information is traveling at the speed it takes our email to refresh," McCaskill said in an open letter to Michael Huerta, acting administrator of the FAA. "The current rules are inconvenient to travelers, don't make sense, and lack a scientific basis. Airline employees have the incredibly important job of keeping us safe in the air – their efforts are better spent worrying about rules that actually accomplish that goal." McCaskill, who serves on the Senate Committee on Commerce, Science, and Transportation that oversees many aviation rules, pointed out that the FAA has already certified iPads for use by pilots at all stages of the flight. The decision in September will save an estimated $1.2m, and stop considerable back problems for pilots by relieving them of the 35lb of manuals they usually have to carry. Although the FAA announced a review of its current policy in August (the last one was back in 2004), McCaskill said she was concerned about the "longstanding intransigence" of the agency over the issue. The current rules are "dated, at best," she said, and were harming the image of the FAA with an increasingly skeptical public. She noted that only last week the head of the Federal Communications Commission (FCC), Julius Genachowski, added his voice to the growing clamor for change. While she looks forward to seeing the results of the FAA's review into the used of personal electronic devices (PEDs), she isn't prepared to wait too long before acting. "While the agency can and should use existing authorities to allow for the broader use of PEDs, I am prepared to pursue legislative solutions should progress be made too slowly," she warned. Current policy on the use of PEDs is a complete ban below 10,000 feet and flight-safe mode only for wireless devices above that ceiling – and it hasn't changed much since its introduction in 1991 over fears of interference. While it has never been proved that in-flight electronics could interfere with aircraft systems, there are thousands of devices out there and no one's done the testing. There are good reasons for at least some of the rules. Over 90 per cent of passenger casualties come in the first and the last five minutes of flight, and having people focused and ready to react – or at least not wearing headphones – makes sense. Concerns have been expressed over the fire issue. It's not unknown for electronics to overheat or, in the case of some dodgy batteries, combust. An in-flight fire, particularly when flying over an ocean, is one of the nastier safety situations that air crew train for, just behind a massive loss in cabin pressure or a reduction in the number of wings. There's also the projectile effect, with that slim fondleslab becoming a very effective missile if the plane slows suddenly. Even when taxiing, some aircraft are toddling along at 25mph but can brake sharply if necessary, something people in a rush to get their stowed luggage would do well to remember.